ALO7 is the largest K12 digital English Language Teaching (ELT) content producer and solutions provider in China. The ALO7 team members are professionals in the field of young English learners’ education reform in the Mobile Internet Age. ALO7 is used in nearly 100 cities throughout China by more than 4,000 training schools, and more than 15 million students experience the joy of learning English through ALO7. ALO7 grew out of Saybot Information Technology, Ltd., which was found in Boston in 2004 by digital pioneer Professor Nicholas Negroponte, and the father of e-mail, Professor Leonard Kleinrock, along with several international venture capitalists. In 2010, the ALO7 Network Technology Co., Ltd launched its own education brand—ALO7, servicing students between 3 and 15 years old. ALO7’s goal is designing entertaining and efficient products tailored for Chinese students. ALO7 is a multi-dimensional learning product for young English learners, combining innovative educational methodologies with the latest technologies. ALO7 products include printed textbooks (ALO7 Student Books, Craft Books, Workbooks, Storybooks, Phonics Readers, and ABC Readers), fun and interactive software (ALO7 Courseware), an after-school learning platform where students practice listening, speaking, reading, and writing (ALO7 Learning Platform), an online school-to-home contact platform to improve communication and management (ALO& Learning Feeds for Parents and Teachers), foreign teacher-led tutorials via online classrooms (ALO7 Online Tutoring), and a variety of other educational products. ALO7’s cross-platform products form the ALO7 digital ELT ecosystem making ALO7 a leading company in the field of education. ALO7 supplies digital English Language Learning (ELL) and ELT materials to well-known English training institutions, such as New Oriental, Only Education, Best-Study Education, Bond Education, and Daqiao Education. ALO7 learning products are widely used by English training institutions, students, and parents. Over 4000 training schools use ALO7’s digital materials and over 15 million students use ALO7’s Learning Platforms. ALO7 Courseware (ALO7 English Teaching Courseware) contains over 400 efficient, systematic, and engaging multimedia courseware sets, greatly enhancing the efficacy and interactivity in classrooms. ALO7’s well-designed courseware creates exciting and engaging lessons, combining ALO7’s English curriculum with animation, audio, activities, and games. Through listening, watching, speaking, and imitating various characters, students learn to naturally think and respond in English. Activities and games provide learners with ample opportunities to demonstrate mastery of new knowledge in a stimulating setting. ALO7 Learning Platforms (ALO7 English Learning Website) are tailored for children between the ages of 3 and 15. Experts and scholars from Harvard University and Massachusetts Institute of Technology have heavily invested in utilizing advanced technology and strictly prescribed teaching methodologies, providing more than 500,000 listening, speaking, reading, and writing exercises, along with 300 interactive leveled readers and various learning applications. This interactive online homework platform is entertaining and effective, enabling children to learn English instinctively and to improve while enjoying the learning process. ALO7 Online Tutoring is a set of solutions providing foreign teacher teacher-led online classrooms. Through careful selection and management of professional EFL trainers abroad, the need for our partners to recruit and manage a staff of foreign teachers can be eliminated. Furthermore, institutions can easily combine their offline classroom teaching with online courses. This enlarges the scope of students enrolled, increasing the conversion rate of students for institutions. ALO7 Learning Feed for Teachers (ALO7 Online School-to-Home Platform for Teachers) enables teachers to accomplish all of their non-teaching tasks in an efficient and timely manner. ALO7 Learning Feed (ALO7 Online School-to-Home Platform for Parents) is a platform for parents to communicate with teachers in real-time and supervise students’ learning. It helps reduce communication costs and aligns communication between teachers, parents, and students. This enables parents to directly oversee their child’s learning progress. ALO7 Assessment (ALO7 Learning Entrance Assessment App) is a creative English assessment tool designed especially for Chinese students. We have innovatively applied a scientific assessment model—the Adaptive Assessment Model—that replaces traditional paper-based tests in order to effectively measure the competency of English learners. This assessment model is embedded with exercises and vocabulary from ALO7’s key curriculum, assessing different skills from reading and writing, to listening and speaking. The assessment model helps schools and institutions accurately and efficiently provide suitable teaching materials to students. This scientific assessment method has been widely adopted by and increasing number of schools and institutions. ALO7 Principal is an effective operation and management tool for school or institution management teams. The four main functions cover the core management processes in schools that form a comprehensive standardized management system. Using ALO7’s apps allows principals, teachers, parents, and students to communicate effectively and enhance operational effectiveness and efficiency. Learning capacity is the culmination of learning ability, motivation, attitude, and creativity, making it the most important gift to us as individuals. ALO7’s ultimate goal is to help children acquire lifelong learning skills and does this by combining the latest scientific technology, groundbreaking educational ideas, and endless creativity. Childhood is the best period to develop learning capacity. Rote learning destroys the passion children have for learning, and unfortunately, the concept of “educational play” has not been adopted in China’s mainstream educational facilities. Therefore, ALO7 wishes to cultivate innovative learners who are able to develop life skills that will help guide them. By balancing education and play, ALO7 awakens and ignites children’s passion for learning and teaches them how to learn. "Five loves" reflects ALO7’s core spirit of self-realization, teamwork, and social contribution. A pioneer in the online education industry, ALO7 emphasizes the spirit of giving before taking. ALO7 values its organizational and collaborative ideals along with the principles of self-motivation, self-study, and innovation. Our mission is to be the leader of using cutting-edge technology to benefit society by creating high-quality learning products and services. In 2004, after his graduation from MIT, Dr. Pan returned to China to start a business using advanced technology to improve Chinese students’ language acquisition. He made use of speech recognition technology to create the Saybot Player. However, the online education market did not mature until several years after its release. At the same time, Andrew Shewbart, the Academic Director of Disney English (DE) at the time, was frustrated with the inefficiencies in English language classrooms and looked for a opportunity to improve the situation. In 2008, Dr. Pan sent his son to DE to study conversational English and it was there that he met Mr. Shewbart. The two quickly bonded and formed a professional commitment. They made full use of their individual strengths to develop a multi-faceted English teaching and learning system: ALO7 English for Kids. Eight years later, after much growth and transformation, ALO7 was able to provide a total solution for training institutes, from curriculum design to educational practices and methodologies, artistic design, technological support, and teacher training. Dr. Pan and Mr. Shewbart, two pioneers in Chinese children’s interactive ELL, created the perfect combination of technology and education and technology. Dr. Pan Pengkai is an internationally renowned children’s educational expert. After his graduation from Zhejiang University, he studied under Professor Nicholas Negroponte, the famous digital guru, and received his doctorate from the MIT Media Lab. During his Masters and PhD studies, Dr. Pan achieved groundbreaking results at MIT’s Media Lab. He has published dozens papers on a variety of educational and technological topics. In 2003, he was the recipient of a scholarship from the Chinese Ministry of Education, awarded by the Premier Wen Jiabao. In the summer of 2004, Dr. Pan established ALO7 (formerly Saybot), with the support of Harvard University. He has been invited to Harvard University, Stanford University, and Geneva educational conferences to deliver speeches regarding the future of education for children. Mr. Shewbart holds an MA from the University of York in Teaching English to Young Learners and a BA from Vanderbilt University. He was certified by Columbia University Teachers College in Teaching English as a Foreign Language to Children. 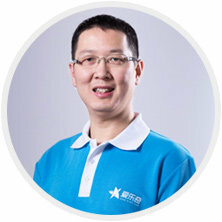 He is also an author of Columbia University Teachers College’s TEFL-C module “Teaching through Technology,” and is mainland China’s sole examiner for the program. Mr. Shewbart is the leading consultant for CCTV’s educational English programming. He is an internationally renowned expert on children’s ELL production, teaching theory, practical teaching, and using technology to empower teachers, children, and parents in the digital age. Before joining ALO7, Mr. Shewbart founded and operated William Language Schools, a chain of 17 ELL schools in Taiwan. Seeing new opportunities to help a larger group of students, he came to Shanghai, joined the Disney English team, opened the first four DE Learning Centers, was a leading creator of DE’s content, and hired the first 100 local and foreign DE teaching staff members. Mr. Shewbart was the first employee of the DE joint venture and the first Academic Director. With over two decades of teaching experience in China, Mr. Shewbart understands the problems that Chinese children encounter while they are learning English. 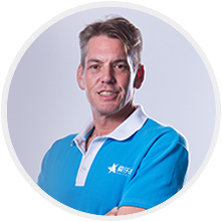 He has applied advanced teaching theories, leveraged many years of practical teaching experience, and employed cutting-edge technology in the research and production of ALO7’s entire product range.